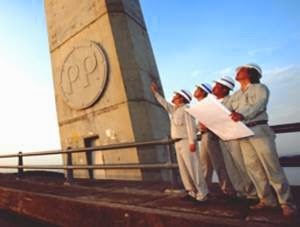 PT Pembangunan Perumahan (Persero) Tbk - PT PP (IDX Stock Code: PTPP) or referred to as "PT PP (Persero) Tbk" is a Government-owned corporation (BUMN) in Indonesia, running business in the field of Construction and Investment. The Company was formed in 1953 and has more than 60 years of experiences in construction of prestigious building, infrastructure, property and Engineering, Procurement and Construction (EPC). The Company is based in Jakarta and has its business activities focused in 6 business pillars: Construction, Property, EPC, Precast, Equipment and Investment. At present, PT PP (Persero) Tbk has 9 domestic branch offices and 1 overseas branch office; Branch I Medan, Branch II Palembang, Branch III Jakarta, Branch IV Bandung, Branch V Semarang, Branch VI Balikpapan, Branch VII Bali, Branch VIII Makassar, Branch IX Pekanbaru and Timor Leste Branch Office. In term of financial positions, PT Pembangunan Perumahan (Persero) Tbk is running well in the second quarter of 2016 (2Q16, ended in 30 June 2016). According to PT Pembangunan Perumahan (Persero) Tbk Company Update August 2016 as cited by JobsCDC.com, PT Pembangunan Perumahan (Persero) Tbk reported total revenue of Rp 6,472 billion in 2Q16, up 23.69% year on year from Rp 5,221 billion in 2Q15. Total new contract in 2Q16 amounted to Rp 14,093 billion, up 4.86% from the same period at previous year (2Q15) of Rp 13,440 billion. Male / Female, with the maximum age of 28 years old. Candidate must possess education at least Bachelor Degree (S1), majoring in Law with GPA ≥ 3.00 from reputable university. Have strong understanding about the principles of business law, criminal law, contract law. Minimum 1 years of experience in the field of law. Willing to be placed throughout the area operations of PT PP (Persero) Tbk (all over Indonesia and overseas). Candidate must possess education at least Bachelor Degree (S1), majoring in Electrical Engineering (Strong Current) with GPA ≥ 3.00 from reputable university. Have strong understanding about the principles of electrical engineering, electrical work building, procedures of procurement and implementations electrical functions in the project. Candidate must possess education at least Bachelor Degree (S1), majoring in Mechanical Engineering with GPA ≥ 3.00 from reputable university. Have strong understanding about the principles the principles of mechanical engineering, procedures of procurement and implementations mechanical functions in the project. Have strong interest and knowledge in the field of EPC (Engineering, Procurement and Construction). Candidate must possess education at least Bachelor Degree (S1), majoring in Psyhics Engineering (Control & Instrumentations), Electrical Engineering (Control & Telecomunications) with GPA ≥ 3.00 from reputable university. Have strong understanding about the principles the principles of electrical engineering, electrical work building, procedures of procurement and implementations electrical functions in the project. JobsCDC.com now available on android device. Download now on Google Play here. Please be aware of recruitment fraud. The entire stage of this selection process is free of charge. PT Pembangunan Perumahan (Persero) Tbk - Management Trainee Program PTPP December 2016 will never ask for fees or upfront payments for any purposes during the recruitment process such as transportation and accommodation.